Our house is situated on the sunny Schwendberg. 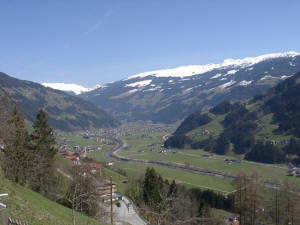 At an altitude of 810m we can offer a lovely view over the Zillertal. 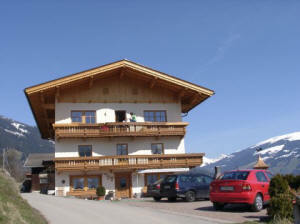 Our house is slightly away from the climb to the Zillertaler Alproad and therefore in very quiet surroundings. The view covers the complete back of the Zillertal, from Zell am Ziller to Mayrhofen with the almost 3000 m high Ahornspitze. The favorable location means that you can reach the valley quickly (only 2,5 km or 5-10 minutes by car to Hippach and the skilifts), for skiing or for excursions in summer in the Zillertal, but you are also near the alpine pastures and the Zillertal Alproad which leads you to an altitude of 2000 m.
In our large in 2007 renovated house we offer two holiday apartments, Ahornblick and Zillertalblick, which both offer accomodation for 2-7 Persons. The new furnishing is comfortable and modern with separate bedrooms, a beautiful livingroom/kitchen with TV and shower/toilet. Bedlinen, hand- and bathtowels are at your disposal. As a member of "Urlaub am Bauernhof"> ("Holiday at the Farm") you will get typical products from our bio-farm like schnapps, milk, jam and butter. But you can also enjoy the delicacies of two good restaurants in the direct neighboorhood, the Paulerhof and the Schwendberger Hof are at less than 15 minutes walking distance.